It's the last working day of 2017 for me, and of course I've been looking back and looking forward. It's a lovely thing to do. Identifying the highlights of the past year, and dreaming just that little bit more ambitiously about the year to come. In 2017, I experimented with still conversations: a peer-learning, coaching-inspired way of giving sustainability leaders the space to reflect and think aloud, so that they can go back to their work refreshed and inspired to make more change for the rest of us. In 2018, these will run again and they will be a key part of the work I do to support change-makers. People who need to build their own (or their organisation's) resilience, and who want to make more change, are welcome. Change Management for Sustainable Development was published by IEMA. In writing it I got to interview some of the best in the business - in-house leaders who want to build a better world and know how to transform an organisation from the inside-out. In 2018, I'll be sharing more of these insights through blog posts, webinars and with clients. I was honoured to be made a Fellow of IEMA in the summer. In October I joined hundreds of other facilitators at the IAF's Europe, Middle East and North Africa regional conference in Paris. What a wonderful event! I learnt so much and was able to share some of my own expertise with facilitators from all over the world. My CPD next year will be a bit 'out there' - I'm taking part in Belina Raffy's Sustainable Stand-Up communications course. And yes, there will be a show in late May. Come and laugh with / at me! One other highlight from 2017 was She is Sustainable - a warm and supportive event organised by women working in sustainability, where older women shared their life stories and hard-won wisdom with younger women just starting out on that journey. I was so inspired by facilitating the open space sessions. In 2018, working with some other wonderful sustainability women, I'll be putting on She is Still Sustainable. This sister-event will be for women who have been around the block a few times, working in sustainability and related fields, who are ready to take stock and plan their next adventure. Throughout the year I worked with clients who are campaigning, innovating, convening and collaborating for sustainability. The kinds of things I helped with included organisational development and strategising, capacity building around facilitation and engagement, designing and facilitating workshops, coaching... I am looking forward to stretching and being stretched by ambitious, imaginative clients in 2018, and helping them make change! Are you coming to EMEX next Thursday 23rd? Or to IEMA's Leading the Way conference, which is running alongside it? 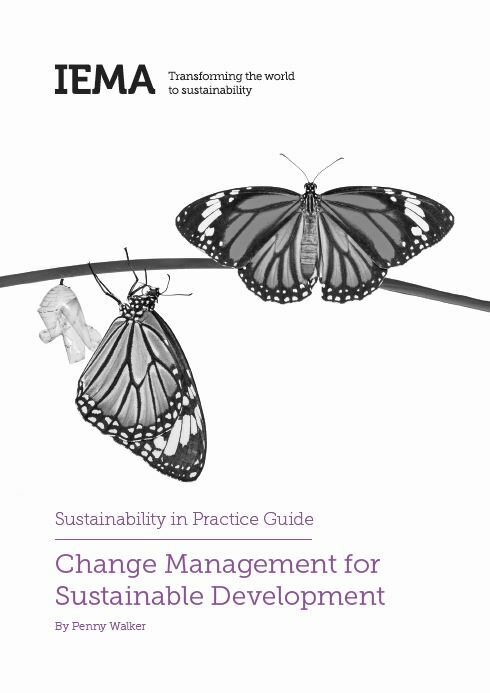 I'll be hanging round the IEMA stand in the morning, and then giving you all some sneak peeks at the shiny new improved and fully updated second edition of Change Management for Sustainable Development. I'll be joined by the wonderful Jane Ashton (TUI Group) and Vicky Murray (Pukka Herbs), with Nick Blyth from IEMA to help us out and some surprise guests. Thanks for coming. Thanks for the work you choose to do. It was great to see so many sustainability change makers at this event, and if you came along you'll know what I mean about saying 'thank you' to each other. We were also joined by Tim Balcon of IEMA, Tony Rooke of CDP, and Alan Knight of ArcelorMittal. These are the slides that I used to introduce the forthcoming second edition of Change Management for Sustainable Development. As they describe, the book is interactive, built from stories and practical advice, with exercises with allow the reader to reflect and note down their own insights and answers. I really hope it's useful to you. I’m honoured and proud to have been invited to become a Fellow of the IEMA (Institute of Environmental Management and Assessment). Supporting and challenging my colleagues in the sustainability profession has been a huge part of my career. I completely love helping them (you) to learn about how to make more change, how to stay resilient, how to find their path and bring their best – their whole selves - to this demanding and essential work. IEMA has been a big part of that: publishing my first book and providing a platform for me to share what I’ve learnt about organisations and people through regular features in The Environmentalist magazine, as well as training workshops and conference sessions. It’s great to have my work recognised in this way, and to feel that this profession values the insights I’ve been able to bring. I’m now even more fired up as I think about this autumn’s work: completing the second edition of Change Management for Sustainable Development, and running the second season of Still conversations for sustainability leaders. So thanks to everyone in IEMA for this recognition. I look forward to continuing to work with you to transform the world to sustainability! Join me at the IAF's Paris Conference, in October. I'll be sharing powerful tools for planning stakeholder engagement (pdf). Here's a little taster video. See you there!